Fun, colorful textbook and two CDs. Ideal for children who do not yet read. For use by K-1 school teachers or parents. The text has a brief explanation of Spanish conjugation to help parents understand verb usage. The Spanish for Young Children text features illustrated words, sentences and expressions common to a child’s daily vocabulary. The objective is to teach not only numbers, colors and animals, but to introduce a rich vocabulary in context, including relevant phrases for the target ages. 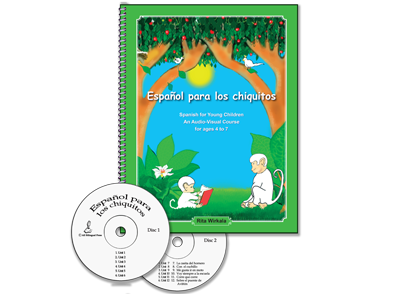 Spanish for Young Children can be used either in the home school setting, with the help of the audio CD, or in the classroom. This method is easily adaptable for multi-level classes in which kindergarteners and first graders learn Spanish alongside older children. The activities based on the text match the corresponding illustration with spoken words, drawings, coloring, and speaking in the form of dialog or questions and answers prompted by the Spanish audio-based lessons. Vocabulary words also appear in printed form next to the drawings for students who can read and as a guide for non Spanish-speaking parents. Written exercises are also included so children who are ready can start practicing and developing writing skills.